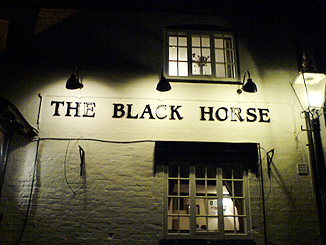 The Black Horse was built as a coaching inn during the early 16th century. Set back and up from the road, there is limited parking here. There are stpes into and throughout the pub so not good for the disabled. It was once a blacksmith's and you can see that in the interior layout. There is a split level with the room on the right (no smoking) being down a step. The toilets are also through here and require a step up. The other end of the pub behind the central fireplace is also no smoking. The small bar faces you on entrance and you notice that the pub itself is quite small and cosy. They serve up to four real ales and someone has already told the bar staff to top up pints with large heads. There are bar stools here, though, they vary the amount for the time of day. Seating in the rest of the pub is at dark wood tables with chairs and stools on dark carpet. On the walls you will notice a lot of cricket memorabilia, most of which is behind glass to protect its significance. There is a dart board at one end of the bar and a TV hidden in a corner of the main bar area. There are a couple of wood burning stoves in the fireplaces which keeps the pub warm in winter. Food is served here most nights of the week and is plentyful and well presented. The choices vary from pigeon to lamb for around £10-£12 and a good vegetarian choice around the £8-£9 mark. The pub gets very popular at weekends for eating, so book in advance.